In this charming regency romance, a dog in need of rescue brings together a young debutante and a mysterious stranger--third in the Chance Sisters series. After a childhood riddled with poverty and hardship, Jane Chance intends to enter high society and make a good, safe, sensible marriage during the London Season. All goes according to plan until a dark, dangerous vagabond helps her rescue a dog. Zachary Black is all kinds of unsuitable--a former spy, now in disguise, he's wanted for murder. His instructions: to lie low until his name is cleared. But Zach has never followed the rules, and he wants Jane for his own, even if that means blazing his way into London society. Jane knows she shouldn't fall in love with an unreliable, albeit devastatingly attractive, rogue. But Zach is determined--and he's a man accustomed to getting what he wants. 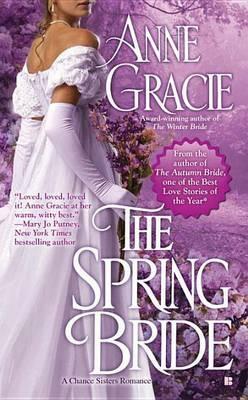 Anne Gracie is the award-winning, national bestselling author of numerous novels including the Merridew Sisters Romance series, the Chance Sisters Romance series, and the Marriage of Convenience Romance series. She spent her childhood and youth on the move. The gypsy life taught her that humor and love are universal languages and that favorite books can take you home, wherever you are. Anne started her first novel while backpacking solo around the world, writing by hand in notebooks. Since then, her books have been translated into more than sixteen languages, and include Japanese manga editions. As well as writing, Anne promotes adult literacy, flings balls for her dog, enjoys her tangled garden, and keeps bees.